Amongst many untold stories of Ramayan, the myth of Mahiravan and Ahiravan is one such story. Untold, as they get added in due course of time, or are specific to a culture while they remain unimportant for many. We will analyse this later, but first the story. After, Ravan lost his brave son Indrajeet in the battle, he was crestfallen. His mother met him and reminded him of what he had done to his family and how he was wrong but his arrogance was not allowing him to see through the web woven by him. Ravan was not willing to listen to anything and from anybody. Before leaving, his mother reminded him of one of his sons (some texts refer to him as brother), Mahiravan, who was ruling in the Patala-loka, or the underworld. Mahiravan had initially decided not to be a part of the battle, as he did not agree with the kidnapping of Sita. Mahiravan was the master of occult and was a devotee of Goddess Kali. Ravan managed to convince Mahiravan by telling him that if he could offer Ram and Lakshman as a sacrifice to the Goddess Kali, she would be happy. When news of Mahiravan’s joining the battle reached the army of Ram, they were worried, especially Vibhishan, Ravan’s brother. Vibhishan knew about Mahiravan’s abilities to change forms due to his mastery in sorcery. 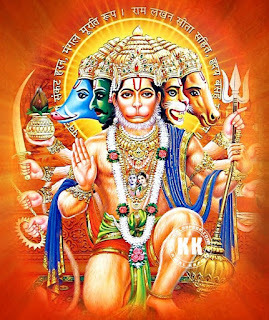 He warned all to ensure that Ram and Lakshman were guarded well and appointed Hanuman to ensure that none got in the cottage of Ram and Lakshman. Hanuman created a shield by his tail, around the cottage where the two were resting and ensured that none could break the barricade. Mahiravan tried many forms but could not pass through. At last, he assumed the form of Vibhishan and approached Hanuman. He asked him to be allowed in, just to ensure that Ram and Lakshman were fine. Hanuman, allowed him to pass without realising that he had just breached the security created by him. As soon as Mahiravan got in the cottage, he cast a spell on both Ram and Lakshman, and took them deep inside the ground. By the time Hanuman and Vibhishan could realise, they were gone. Vibhishan was very worried as he knew what could be the fate of the two. He urged Hanuman to do something. Vibhishan explained that the two were taken deep inside the ground in the patala-loka and Hanuman should go the same way. The adventures of Hanuman in the patal-loka are interesting, but we will not get into the details of it. It is said that when Hanuman reached the patal-loka, it seemed to be a city by itself, with forts and fortresses and guards at every point. After eliminating all opposition on his way, he met one, who seemed to be quite a match for him. This character is known as Makardwaj. We will discuss Makardwaj in the next part of this article. On his way to the patala-loka, Hanuman had heard that Mahiravan was going to sacrifice Ram and Lakshman to the Goddess Kali in return for more occult powers. The myth gets interesting here. Hanuman takes the form of a small bee and approaches the goddess Kali. He asks her, if she wanted the blood of Ram. Kali is supposed to have said that she would rather have the blood of Mahiravan, than that of Ram. She then goes on to suggest a way out, which Hanuman whispers in the ears of Ram. Ram and Lakshman were readied for the sacrifice and at the auspicious time, Mahiravan asks Ram to put his head on the sacrificial altar and ready himself for the sacrifice. Ram said, that he had been a Kshatriya, a warrior, all his life and had never known how to bow in front of anyone, could Mahiravan show him how to bow? Mahiravan was irritated and tried to demonstrate. No sooner had he done that, Hanuman who was hiding behind the idol of Goddess Kali, assumes his form, takes the sacrificial blade and beheads Mahiravan. Thus Ram and Lakshman were saved. He then offered the blood of Mahiravan to the goddess. Another interesting version adds that killing Mahiravan was not going to be that simple. His life was distributed in five different flames around the temple. If one flame was extinguished, it would come up again; so the flames had to be blown off all together to kill him. To achieve this task, Hanuman took the form of Panch-mukhi, or five-faced. By doing this, he could blow all the flames together, thus killing Mahiravan. Matters don’t end here. Mahiravan’s wife was pregnant and it is said that when she came to know about the death of her husband, she joined the fight. In the commotion that is unleashed, Hanuman’s kick lands on her stomach and out comes their child, Ahiravan, ready to fight. Ahiravan is full of blood and mucous, and was tough to get hold of and was proving to be quite a tough match. Hanuman manages to throw some mud on him, gets his hand on Ahiravan’s limbs and dashes the child on the ground, killing him instantly. 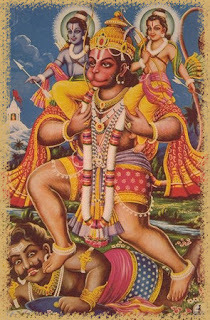 Hanuman then carries both Ram and Lakshman back to the battle field. Both Hanuman and Mahiravan seem to have similar powers to change forms as we have seen, but both use it for different reasons. Hanuman’s role of the killer and a blood-thirsty one at that, especially the way the child Ahiravan is killed bears testimony to the tantric angle to this myth. A very different form of Hanuman, which has rarely been seen. Hanuman has always been portrayed in a submissive, but brave and strong disciple of Ram. Such violent form has seldom been portrayed, and this could be region or even audience specific. The entire myth goes on to highlight the importance of Hanuman. In the entire episode, there has been no role in terms of action from Ram and Lakshman. Very clearly this is a myth which goes on to add heroic credentials to Hanuman. Many also see this as an aspect of ‘myth-making’ to justify the creation of the Panch-mukhi Hanuman, akin to creating the means, to justify the end. An important aspect of this Panch-mukhi Hanuman is the five faces. 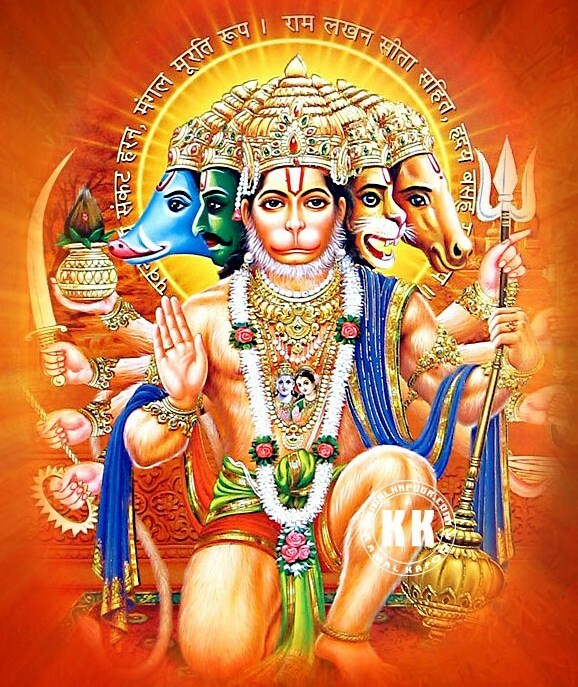 The five faces are that of Hanuman himself, and the other four being that of Hyagriva (horse), Varaha and Narasimha, all three being forms of Lord Vishnu and the final being that of Garuda, again a vahana of Vishnu. In this myth, Hanuman is given the importance of Lord Vishnu himself, which makes him at par with his Lord! While this is strange, such comparisons are not unheard of. Also, keeping with the theme of the Bengali version of the epic, Ram plays a very passive role. A similar underlying theme can be found in the other neighbouring versions, like the Oriya, Assamese, etc. In the actual text, Ram is shown as crestfallen and is even scared at his predicament, when he is about to be sacrificed, a far cry from many other versions of the epic where he is the dynamic hero who gives the war cry. Many scholars have opined that this has a folktale motif and has blended well in the epic. The changing of forms, sacrifices at the altar of Goddess Kali, etc. are very common folktale motifs in the East. The twist of the ‘sacrificer’ getting sacrificed is also a common folktale element, which highlights that gods don’t support their ardent devotees if they take the wrong path. All in all, a very interesting myth. In my last Blog, we read about the Devil or Satan in the Christian and Islamic mythologies. This does not mean that the Satan in some form or the other did not exist in any other mythologies or cultures. Let us look at Mara, the Satan in Buddhist mythology. It would be pertinent to mention that Mara is not a permanent devilish character in Buddhist mythology. He presents himself at an important juncture and shows its presence and thereafter, Mara manifests itself in the form of temptation and other vices for mankind, which again is a common form of the Devil. Mara seems to have tried to lure Buddha many times in different forms. The first time it tried when Gautam (who was not the Buddha then) was leaving the gates of his city after renouncing the world. Mara offered to make him the monarch of the entire universe if he changed his mind of renouncing the world, but Gautam did not heed and carried on his pursuit. The next time we see Mara in a more determined and fuller form. Just before Gautam attained enlightenment, Mara was determined to break Gautam’s firm resolution. Mara decided to attack Gautam with his full army with him atop an elephant. Mara’s followers were armed with weapons and in frightening forms. They hurled their weapons, but the same turned into flowers and dropped on the ground. Next Mara sent whirlwinds and earthquakes, but nothing stirred Gautam. Seeing him frustrated his children asked him the cause of such worry. Mara explained that there was a frail man under the tree who had no weapons, no army, nothing, but still managed to threaten the mighty Mara with his resolution of attaining something. This could lead to his decimation, which he could not allow, but he seemed to be unable to make any difference. He then sent his three daughters to seduce Gautam and lead him into a world of temptation, but Gautam did not even feel their presence. As a final try, Mara claimed that the place that Gautam was sitting for his penance was his and Gautam should vacate the place immediately. As witness, Mara got his followers to echo his statement. Gautam had no witness to his claim, so he simply let his middle finger touch the ground, to which Mother earth roared back saying that she stood as a witness to Gautam’s right to the spot. Seeing this, Mara knew that he had lost. However, not the one to give up easily, it is said that Mara called for rains to pour down heavily on Gautam. But the king of serpents who wanted Gautam to succeed came to his rescue. It coiled down under him to raise him above the mud and waters and spread its broad hood above Gautam to allow him to meditate. With this Mara knew that he had lost and he left the place with his followers. 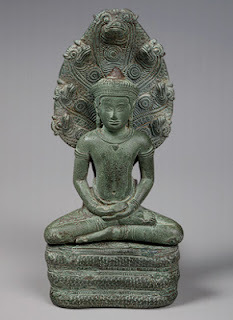 It is said that Gautam was now at peace and his meditation continued for about forty-nine days, after which he attained enlightenment and he became the Buddha. The concept of an evil being in mythology is a common factor. 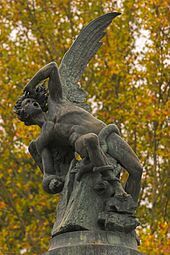 The intense clash with the devil or evil beings in mythology helps to refine the hero’s character and the glory at the end of it aids in the process of deification. In the case of Mara, he is personification of all the negative elements in human life, prime among them being temptation. According to Buddhists texts, Mara also means the end of spiritual life or spirituality. In one of the texts detailing the above event, Mara’s army is said to consist of lust, hunger, thirst, craving, doubt, cowardice, etc. His three daughters who were sent to seduce Gautam had the ability to take different forms to lure and charm. Some texts have mentioned five daughters of Mara, whose names meant, attraction, aversion, delusion, pride and fear. Here Mara is nothing but the different temptations which lead man to all sorts of trouble. Another interesting aspect of this myth is the support Buddha gets from the earth and the serpent, both of which are prominent Hindu deities. 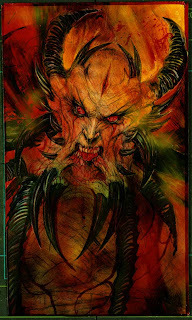 Many feel that the character of Mara was based on the Vedic demon, Namuci. This entire episode in the life of Buddha, blends well with the mythological tract of a hero’s clash with the evil, as well as blend with the Hindu elements of aid coming from other minor Hindu deities in the quest for enlightenment. 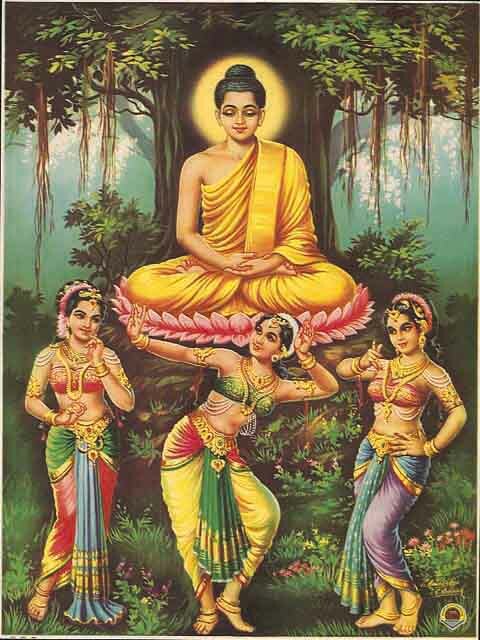 An interesting myth on the occasion of Buddha Purnima, today! In the world of mythology (and sometimes theology) all creation has been credited to the primeval entity, the Creator. All that we see, the universe, the earth, the rivers, mountains, plants, animals, man, have been created by the creator, whom we will refer as God. Sounds great. This brings forth a debate though – if everything was created by god, then did he also create evil and the Devil? If god created everything so beautiful, why did he have to pepper it with a devil and his home, the hell? This brings me to an interesting Christian myth known as the fall of the angels. Before God sent his chosen son to the earth, Lucifer was an angel in the kingdom of God. Lucifer was of the opinion that he was the most favoured amongst all the angels, till the day, when God ordained that Christ, his son, was equal to him and would also be the chosen one amongst all to lead God’s mission. Lucifer was disappointed and saw the elevation of Christ as an unfair gesture on the part of God. Lucifer’s discontent with God soon gathered momentum into a rebellion by a small group of angels led by him. The others tried to pacify Lucifer and reason out that if God had chosen his son to lead, then there was nothing wrong in it, but Lucifer and his followers would not listen. Soon the matter reached God and his Son and matters came to a confrontation. It is said that God threw Lucifer and his angels out of his kingdom and thus the term – fall of angels. It is the same Lucifer who then became Satan or the Devil. A similar example is found in Islam. According to Islam, the character similar to Lucifer was Iblis. However, Iblis was not an angel, but a Jinn. According to Islam, angels were servants of god and could never disobey Him, but Jinn’s were like humans who could make choices (to follow the right path or not, or to obey or not). Iblis’s crime was that he had refused to bow before Adam. For this he was banished from Jannat, heaven and thus he became Shaitaan or the Devil. It is said that from day onwards, Shaitaan took upon him to create mischief for God’s creation by leading him into temptation and commit sin; the creation which god was so proud of. So coming back to the first question, did god create Satan/Shaitaan? Did he not have in him the power of destroying this evil, instead of just throwing him out of his kingdom? Lucifer in Latin means the ‘morning star’ or the planet Venus. It is called the morning star as it heralds the advent of morning. If this sounds ironic for a character who is characterised by darkness and all things negative, then herein lies the message. Lucifer was an angel, but Satan is the devil. This might imply, that there is both good and evil in man, it is only which one finds prominence in the personality. If man has the choice, then what choice should he exercise – to be good or to be evil? Philosophers say that the Creator did not want to create followers, who had no choice but to praise him. Along with man, He created conscience and free will. Man has the choice and depending on his faculties and the ability to choose, he chooses the path of righteousness or evil. Lucifer had the choice of being loyal to God and be an angel, but he chose to rebel and become Satan. For the religious, this is a debate of God vs. Satan. For the rationalist, this is a debate of good vs. evil or right vs. wrong. Whatever it be, one thing is for sure, the greatness of good gets highlighted only in the awareness of what is bad. If you have not burnt your hand, you wouldn’t know what it feels like when you run cold water over the burn. *The quote is taken from an article from Spiritual Atheist, The Economic Times.